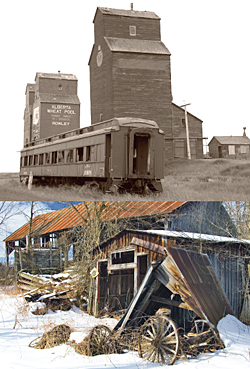 An old railway car and grain elevators offer a glimpse of the past at Rowley, Alta. ; time and weather have transformed these farm buildings near Perth, Ont. Ghost towns. The words conjure up visions of abandoned outposts, tumbleweeds, rusted farm equipment, flapping window shutters, and the occasional drifter just passin’ through. However, ghost towns remain very much a part of the Canadian landscape. Do a little digging in your public library or on the Internet, or just drive around the back roads close to where you live and you may come across the quiet and dusty remains of old buildings that were perhaps a lot busier at one time. You may even discover something you didn’t know about how your community or our country was settled, opened up for farming or other business interests. A case in point: In 1915, the village of Cheltenham Brickworks, northwest of Brampton, Ont., was home to brickmakers working at the nearby Interprovincial Brick Company. In its heyday, the company baked the local Medina Shale clay into 90,000 bricks at a time, using seven giant kilns. “Rather than living in nearby Cheltenham or Terra Cotta, many of the workers preferred to pay the much lower rent of $13 per month to live in one of the 14 houses located on the site,” explains Jeri Danyleyko, one of the people who runs www.ghosttownpix.com. Nobody builds a town for the sake of abandoning it. So why are there so many ghost towns in Canada? The simple answer is that towns are mostly built for economic reasons. When those reasons cease to exist, so do the towns. In Newfoundland, nearly 600 fishing communities have been abandoned over the years; reducing that province’s total settlements from 1,450 to around 800. One of the lost outports is Indian Burying Place. Established in 1720 on remote Notre Dame Bay in western Newfoundland, the community was abandoned due to government resettlement efforts in 1968. Even today, there is no road to Indian Burying Place. It can only be reached by boat, and only when the seas are relatively calm. “Indian Burying Place is very much a time capsule,” says Russell Floren, president of Lynx Images which has published a number of books on Canadian ghost towns. “It has around 40 homes, many of which have their dishes, linens, and furniture inside. Down by the sea, Indian Burying Place’s wharves are also somewhat intact, as is the village’s old store. So much is still there; just no people! “There’s another abandoned outport called Williamsport, which was a whaling community,” Floren adds. “It was shut down in 1979, but the huge storage tanks there are still full of whale oil. It was just too difficult and expensive to remove it, so they left it there.” He notes that many houses were floated from Indian Burying Place and Williamsport to new sites when these communities were abandoned. However, the cost of doing so prevented poorer residents from taking their homes with them. Some were too broke to even move their larger possessions, which is why so many were left in place. In continental Canada, many remote communities have been built–and are still being built–to provide accommodations for miners. The scenario goes like this: A valuable mineral deposit is discovered in the wilds by a prospector. A mining company comes in to dig it up, and builds a company town to house its workers. Once the town is established, it takes on a life of its own; adding shops, schools, churches, and the all-important post office to serve the miners and their families. The town thrives as long as the mine is open. But eventually the minerals run out, or market values make the mine uneconomical to operate. So the mine closes down, throwing the inhabitants out of work. With no other industry in town, the people leave; gutting the local economy. Stores close, as do schools, churches, and the post office. Eventually, everyone is gone, and all that is left are the buildings and roads. The buildings can’t be sold, because the location is considered by many to be worthless. Sometimes a town gets lucky, as was the case with Elliot Lake, Ont. When its uranium mine shut down, the town turned itself into a retirement community by selling empty modern houses to retirees at extremely good prices. 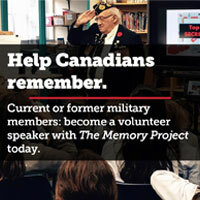 But Elliot Lake is, indeed, the exception. Most resource-based towns die once the resources they were built to harvest are gone or are no longer worth the cost of collecting or harvesting. Such is the story of Burchell Lake in northwestern Ontario, located an hour’s drive west of Thunder Bay. Prospectors found copper in the area in the mid-19th century, but it took the arrival of Ontario & Rainy River Railway at the turn of the 20th century to make mining possible. By 1903, the mine was producing 768,000 pounds of copper, according to research by Yvan Charbonneau posted on www.ghosttownpix.com. It’s not always industry that causes the death of towns; sometimes government has a hand. For instance, the Ontario community of Burwash was supported by Burwash prison; a provincial ‘prison village’ built in 1914. Burwash prison once held more than 650 prisoners and had a hospital, church, school, post office, skating rink, cemetery, hospital, barber shop, and a church. Up to 1,000 support staff lived there in Burwash’s heyday. In 1994, the provincial government bulldozed the Burwash site. Today, the area is used by the military for training exercises. On the Prairies, the federal government hastened the death of many small railway towns by ending the Crow rate. Back in 1897, the Canadian Pacific Railway agreed to reduce rates for transporting grain and flour in perpetuity in exchange for a $3.3 million subsidy and the right to put a line through British Columbia’s Crowsnest Pass, hence the term Crow rate. A look through his Prairie web pages at www.ghosttownscanada.ca tells the story. There’s photo after photo of abandoned houses and barns, decaying grain elevators, and boarded-up stores. In a 2004 photo of Hoosier, Sask., a once-proud brick school stands empty with a broken window, an old hay wagon parked in front amidst overgrown grass and garbage. It speaks volumes about ghost towns, and the common thread that binds them. The most striking feature of ghost towns is decay. Nothing is so eerie–yet poignant–as the fading painted walls, collapsing roofs, and empty streets of communities that were once alive and well, and are now only haunted by the dreams of the people who built them. Still, water and weather are the bane of all human-made structures; particularly those of wood and glass. A glance around any 20th century ghost town illustrates just how quickly decay sets in, while a look around a 19th century site indicates how completely nature reclaims its own, although, remarkably, many of these structures have remained standing, almost as if they are in defiance of anything that time may bring, including extreme weather. If the preceding tales have piqued your interest in ghost towns, you may be thinking of visiting a few on your own. Finding them is not that hard, thanks to the websites listed above (and others like them), which you can access on your own Internet-connected computer or at a public terminal in your local library. There are also many books available on this subject, such as Ron Brown’s Ghost Towns of Canada, and Ghosts of the Bay: The Forgotten History of Georgian Bay by Andrea Gutsche, Barbara Chisholm, and Russell Floren. That’s not all: Old industrial buildings can have asbestos hazards, and there’s always the danger of toxic substances being left on the site. The fact is that abandoned buildings should be treated as dangerous first, and only entered if known to be safe. In those cases when you do get inside, be sure to leave everything as you found it. Responsible ghost town tourists show their respect by not interfering with the site or removing souvenirs. Ghost towns are a striking reminder of how temporary people’s grand designs can be. It is this fact that makes them so poignant, and so fragile in the face of time. Yet ghost towns also provide living glimpses into a vanishing past. This is why so many people are attracted to them. They are a last chance to touch disappeared worlds and childhood memories. They are physical proof that the past did exist, and that the worlds that once were are not entirely gone.